It is a great pleasure to open the 16th International Economic Forum on Africa. Your presence here testifies to the importance of this event, where we will discuss the key role of African cities for African development. A special word of gratitude goes to the African Union for their commitment and support in making today’s Forum possible. 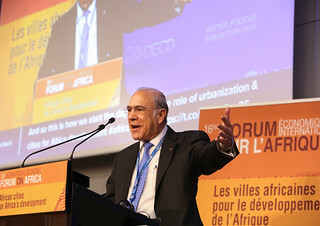 29 September 2016 - OECD Secretary-General Angel Gurría opening the 16th International Economic Forum on Africa. OECD, Paris. We are living in a rapidly urbanising world. In the next five years, it is estimated that the world’s population will increase by more than 400 million. 90% of this increase is projected to occur in urban areas and Africa is a crucial part of this unprecedented story. The continent will become more urban than rural in the next 15 years, and some 55% of African city dwellers will reside in towns and cities of less than one million people. These trends have far-reaching implications for policymakers in Africa, which is why we’ve decided to have this timely conversation with you. As the world prepares to meet in Quito for Habitat III, urbanisation is already part of Africa’s agenda for achieving the Sustainable Development Goals. The objective of sustainable cities and communities is covered by SDG 11 but is very closely linked to the SDGs for sustainable water management and sanitation, clean energy, decent work, industry, innovation and infrastructure. The issue of sustainable cities is also about sustainable livelihoods. That is why African urbanisation is also at the centre of our attention here, as we develop the OECD Initiative for Africa. On that basis, allow me to offer the OECD perspective on five key considerations to make Africa’s urbanisation more sustainable. First, we need to adopt a territorial approach to development that goes beyond the classic rural-urban dichotomy, and instead thinks of urban-rural linkages. Distances between cities are decreasing and the interdependence between urban and rural areas is growing. Cities of all sizes are now centres of intense mobility and trade, and engines of growth and development for entire regions. When it comes to policymaking, we can no longer think of the urban and the rural separately. Second, urbanisation must translate into greater decentralisation of government services. African mayors – of which we have some representatives here today – need the authority to further mobilise fiscal resources locally, as well as the capacity to plan, implement, supervise and evaluate the policies that they are putting in place. Mayors need to report back to their constituencies with hard facts and figures. For this to happen, central governments must support local authorities with funds, human resources and autonomy. Africa’s partners must also make decentralisation and devolution a key development theme, in order to strengthen accountability and transparency and bring policymaking closer to local needs. Third, central governments need higher revenues to be able to devote resources to the local level. With local taxes representing hardly 1% of national revenues in many African countries, and with only 10% of national revenues on average going to local administration versus some 26% in the European Union, we should do more. However, government resources alone, even if increased, are insufficient to address complex challenges such as inadequate urban infrastructures, erratic access to electricity and limited basic services. This year’s African Economic Outlook estimates that some USD 205 billion will be required for sub-Saharan Africa to increase its electrification rate from 30% today to 70% by 2040. What will make a difference is the push by African countries themselves to create the conditions – from business-friendly reforms to stronger rule of law and a more effective public governance – to attract and retain private investments, both domestic and foreign. Fourth, governments, both at the central and local levels, must pay greater attention to the supply of basic services, including to the informal sector. The informal economy dominates the African urban context. It accounts for some 61% of all urban employment and informal settlements shelter some 62% of the urban population. Creative solutions are being engineered every day by those living in informal settlements to access basic services. We must help them. Improving access to basic services and enlarging the coverage of social safety nets are key to reducing poverty for better livelihoods but also to gradually reducing informality. Fifth, investments in urban infrastructure should aim at being green investments. Two-thirds of the urban infrastructure needed by 2050 in Africa has yet to be built. We must get it right, and avoid past mistakes made by industrialising countries in the 20th century. For example, African cities cannot afford to let car-centred urban sprawling be the model for their growth. Recent projects providing mass transportation systems have been promising. Inaugurated in 2015, the Addis Ababa Light Rail has the capacity to transport 60,000 passengers per hour over 31.6 km for the two lines. In Lagos, the Bus Rapid Transit system carries as many as 200,000 passengers per day who pay on average 30% less in fares and spend 40% less time travelling. And there are other benefits: the infrastructure has provided 2,000 direct jobs and as much as an estimated 500,000 indirect jobs. The OECD is ready to support Africa’s way forward. I am pleased to announce that, today, the OECD and AUC signed a new Memorandum of Understanding that will further cement our co-operation. This new MOU is a starting point for a rejuvenated and broader co-operation, and I am counting on both the OECD and the African Union to maximise the joint opportunities ahead. The OECD has already strengthened its collaboration with African institutions, from the African Union, to the African Development Bank and several other regional economic commissions. We are ready to support these institutions in measuring the implementation of the SDGs as well as Agenda 2063. We are already contributing to the development of comprehensive and homogenous sets of data. We intend to strengthen our partnership on a wide array of issues, such as industrialisation, the informal economy, and decentralisation. And, last but not least, I am proud to announce that we will provide a comprehensive data set on African cities – Africapolis – in the next two years. Ladies and Gentlemen, through this commitment to co-operation, we can better understand and plan for the opportunities Africa faces and the challenges it must meet, without forgetting that the specific solutions must be designed by Africans, for Africans. You can count on the OECD to boost dialogue, exchange best practices and share knowledge to advance Africa’s sustainable development. The OECD is ready to design and implement better policies for more inclusive, safe, resilient and sustainable African cities.